Julia Nunes West Coast Living Room Tour! 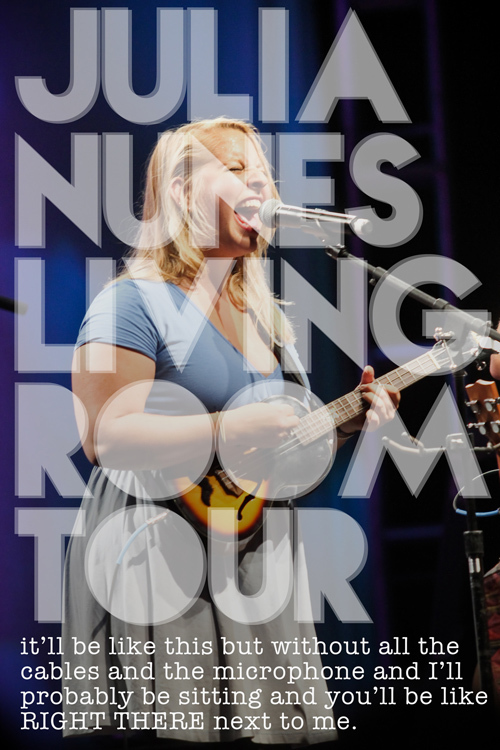 We’re very excited to be helping Julia put together another Living Room Tour! We’ll make this as easy as possible for the hosts. All you have to do is let us borrow your living room for a couple of hours and in return you’ll get 5 free tickets for your friends and our eternal gratitude. We have most of the shows confirmed now. But still need hosts in a few towns. Please read below and get in touch right away if you can host a show in or near one of the cities in bold below. * THE SHOWS ARE ALL CONFIRMED AND TICKETS ARE ON SALE NOW! Please include a photo of the space where you would like to host the show and put “Julia Nunes Living Room Show” and the city in the subject line of the e-mail. Next: Tim Kinsella / Joan of Arc!